Dusty Loft | Whatever you do, you’ll regret it. The European Space Agencies (ESA) space probe Rosetta executed its flyby of asteroid Lutetia a few hours ago. Here is the image taken at closest approach. Lutetia’s name is derived from the Latin name for Paris. It is roughly 100 km large. Rosetta is named after the Rosetta stone. 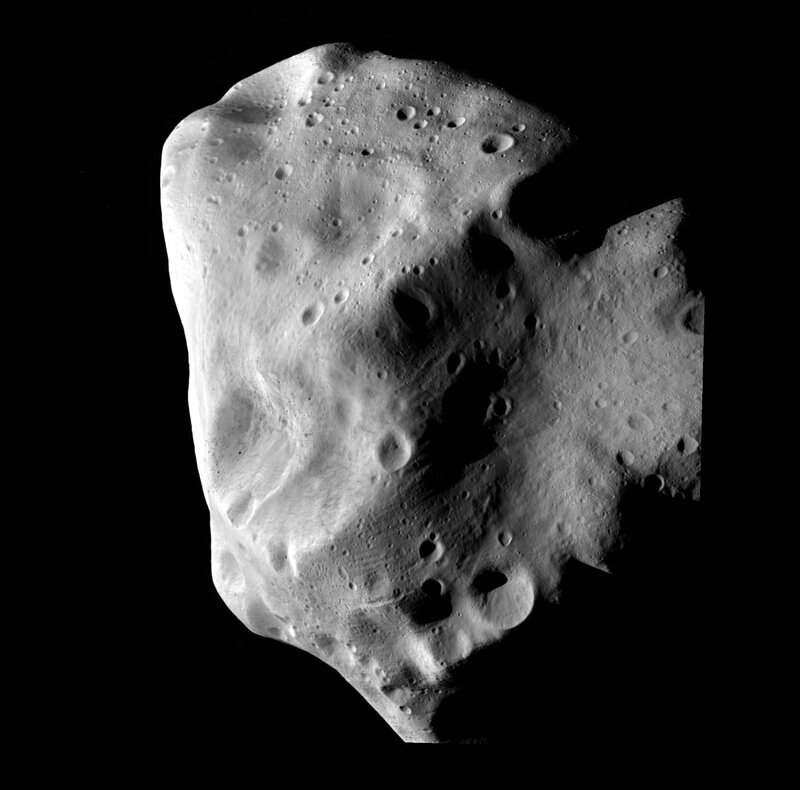 Rosetta passed by asteroid Steins 5th September 2008. A couple of days ago we have had a fine sunset with noctilucent clouds. 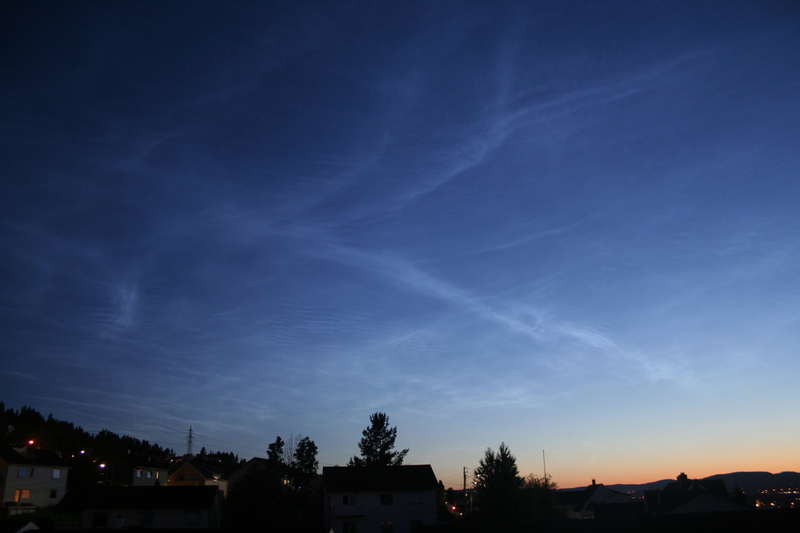 So what is so interesting about noctilucent clouds?. First of all they are clouds made of ice crystals that are extremely high up (75-85 km according to wikipedia). They can only be seen around twilight since they are then illuminated from underneath by the Sun that has already set. They are mostly seen from highish latitudes (50-70 degrees – I am at around sixty degrees). They are fairly uncommon. Revisited because of my previous (failed) attempt to capture noctilucent clouds. Astronomically it is the day when the Earth’s axis tilt is most inclined towards the Sun. In the northern hemisphere this happens around the 20th or 21st of June and in the southern hemisphere around the 21st or 22nd of December. In the image above (taken from APOD) the Sun is photographed at the same time of day throughout the year. 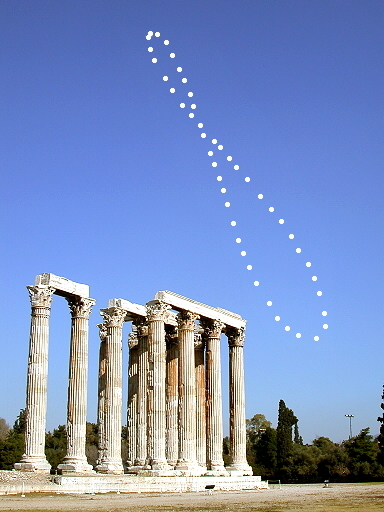 The path it traces is called an analemma. Summer Solstice occurs on the day the Sun is at its highest. The figure of eight is caused because the Earth’s orbit is slightly elliptical and the Earth moves faster in its orbit when closer to the Sun. This means that in some parts of the year the Sun is further along in its path over the sky and at others it is behind. The 24th June I took a day off to spend some time with my two grown up daughters. We try to do this every now and again and spend the day experiencing something new. 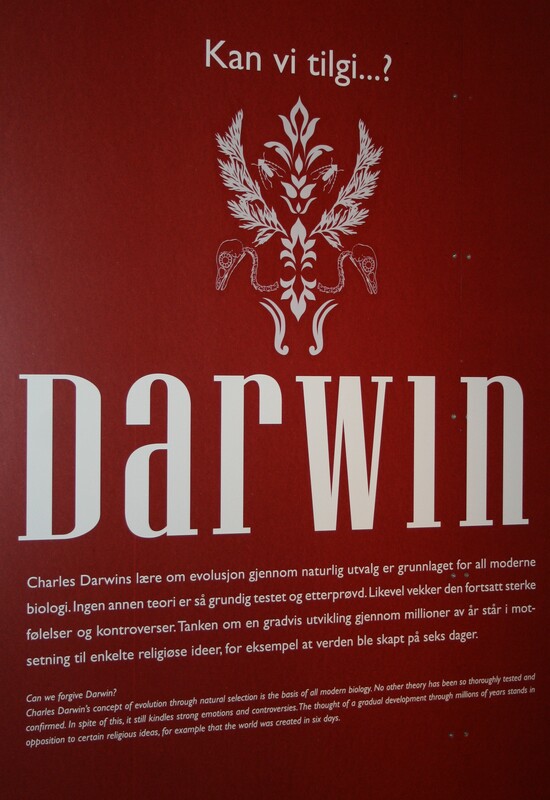 This time we agreed to visit the Darwin exhibition at the Zoological Museum in Oslo. The main object of the trip was to have a look at the fossil Ida (be patient – we will get to her) which is a part of the exhibition. The museum is beautifully situated in Tøyen park. The exhibition was very interesting and well worth visiting though difficult to photograph because of the low light levels. It was very encouraging that many children were visiting the exhibition. Why do we need to forgive Darwin? Science deals with physical evidence not beliefs. Darwin gave the world the best explanation of the physical evidence as to how life came to be as it is. His theory has, with improvements as our knowledge improves, stood the test of time for 150 years and is extremely well supported by the evidence. Evolution is as close to being a fact as any scientific theory can be. Should we forgive Copernicus for his formulation the Heliocentric Theory? Or Newton for his formulation the Theory of Gravity? That is silly. You don’t forgive theories you disprove them – if you can. So far nobody has. We inherit traits from our parents. Eye-colour, muscular strength, singing voice, the shape of our ears and the kinds of food we prefer – all is to some extent inheritable. Darwin grew up in the countryside and was well versed in how farmers used animal traits in animal breeding. No two people are exactly the same. Even identical twins are not quite identical. the same goes for all organisms. 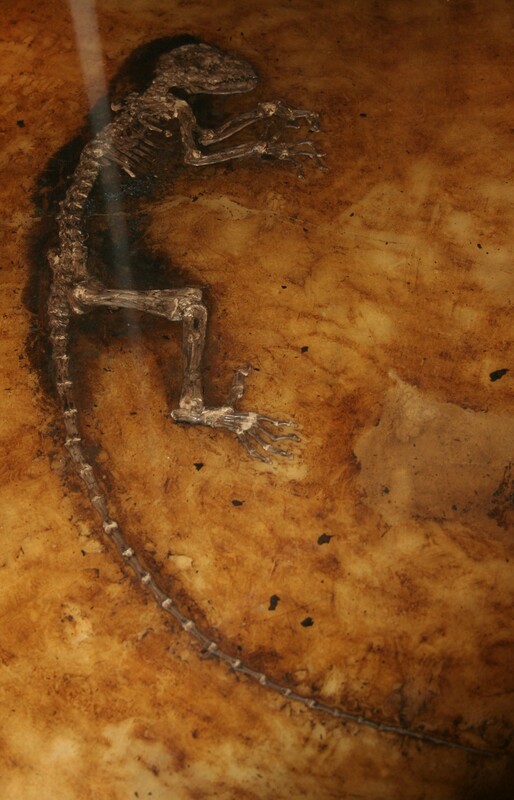 This was already known in Darwin’s time, but the reason for these differences was a mystery. Genes and mutations were not discovered until the 20th century. Darwin was fascinated by the economist Thomas Malthus, who wrote that populations will grow faster than the necessary resources. This holds true for all animal species: Many more are born than grow up. A female cod will spawn millions of eggs during her life, yet on average only two will reach maturity. Survival is not a random process! Some individuals have traits that help them in the struggle for life. It is these individuals who are most likely to reach maturity and breed, transferring their traits to the next generation. Their traits will then become more common with each generation, while the traits belonging to those who did not breed will fade away. In Darwin’s time, it was commonly believed that each species had ‘always been like that’. The conclusion of Darwin’s theory was that species are not that constant. Even small changes in the environment will make species change and new species appear. Darwin argued that all organisms share a common ancestor. And so to our great aunt Ida (Darwinius masillae). 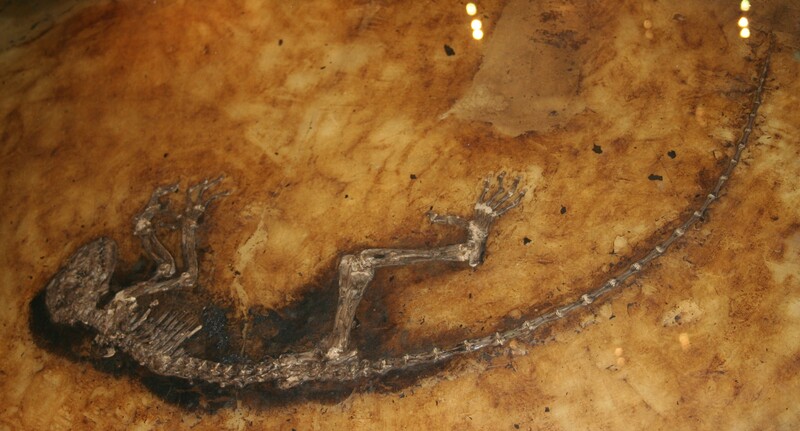 Here are images of the fossil taken through the glass case – hence the reflections.